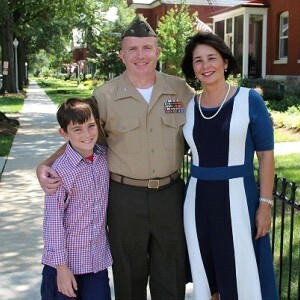 Jo Ann Regan, MSW, PhD is a proud USMC spouse, educator and social worker, parent, and a child of an Air Force officer. Jo Ann shares her personal perceptions of childhood as a military child, and her observations throughout her professional life. It’s an overused word, but it fits: military children are remarkably resilient and often have a mature, inclusive worldview. Key is understanding the joys and the stressors of being a military child/teen. Jo Ann is VP of Education at the Council of Social Work Education and comes to us via our ongoing partnership with the Smith College School of Social Work. Deanne McNulty is a proud Army spouse and the parent of a child with autism. Special needs children in the military present unique challenges for parents and siblings, and this community is tight and resources shared widely and rapidly. Her advice is that becoming a “fierce advocate” for your child matters the most. Deanne shares her experience and how the military community and the civilian communities coexist and blend with the goal of the best possible outcomes for children on the spectrum. These separate half-hour shows share the experienced, fast-moving, and sometimes insular world of the military community. Click below to listen live (Jo Ann Regan in first half of the program, and Deanne McNulty at minute 30) or download the full hour of programs here: http://bit.ly/MilKids_. Air date 26July2016.